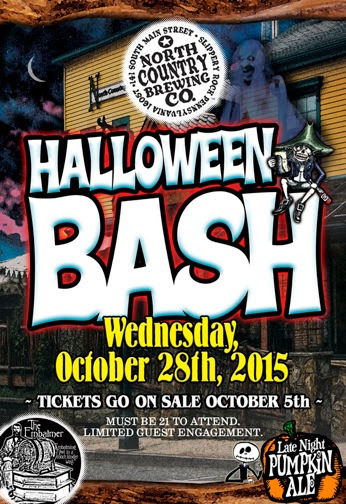 North Country Brewing Company’s Halloween Bash will be taking place on October 28th, 2015. Every year, the event is a major sell out! North Country makes their excellent Late Night Pumpkin Ale which is adored by all. Plus, is that an Embalmer logo I see on the bottom of their poster?? I haven’t even had that one, but I’ve heard it rated as the best IPA some of my hophead friends have ever had. Tickets go on sale October 5th at the brewpub in Slippery Rock. Late Night Pumpkin Cans from North Country Arriving Soon! 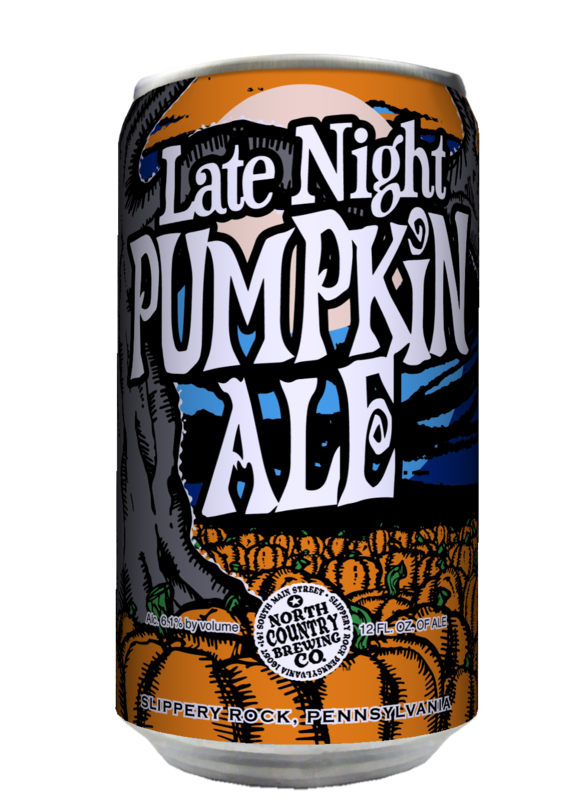 We broke the story earlier this year about North Country Brewing’s Late Night Pumpkin Ale being canned this year. The cans are scheduled to hit stores this month! Let us know of any sightings. Is anyone else ADDICTED to the Fall seasonal from Brew Gentleman, Mexican Coffee? Welp, good news, it’s coming back September 16th! For those of you that may be unfamiliar with Mexican Coffee, it’s a 6.5% ABV oatmeal stout spiced with Mexican vanilla and cinnamon, and it’s been the single most requested beer they’ve made to date. It’s highly addictive. You’ve been warned. Well, this is shaping up to be a fun time! Rivertowne Brewing is putting on a Rhythm and Brews Festival. The live music is featuring Rusted Root! Plus several other bands. The idea of the founder was to have a great day of music and beer sampling in the great outdoors. The $50 general admission ticket includes a souvenir tumbler, unlimited Rivertowne samples, and two full-sized Rivertowne pours in the Beer Garden. Plus, two of the VIP breweries will be showcased each hour. Food vendors will be available as well. All Saints Brewing Company, Fat Head’s Brewery, Four Seasons Brewing Company, Helltown Brewing, Spoonwood Brewing Company, and of course Rivertowne. VIP admission is $80 and includes the above, as well as VIP tent access between 2:00 PM and 7:00 PM, unlimited samples from VIP craft brewers, and light refreshments. ADDED BONUS: If you purchase your ticket before this Sunday (Aug. 23) at midnight, you get a free festival t-shirt! While supplies last. The Corks & Kegs Festival will be held this year on Saturday & Sunday, August 22 & 23, 2015, 11am – 7pm both days. The fesitval is held at the Meadows Racetrack and Casino in North Strabane Township, PA. The awesome news about Corks & Kegs is that there is NO ADMISSION FEE! Yep, just walk right on in. There will be 10 breweries (list here), 7 wineries, food, plus vendors and live entertainment. There’s even a classic car cruise on Sunday! They have the whole schedule listed out here, which is a nice touch. Speaking of North Country Brewing Co., there’s a rumor (that they started!) that they’ll be canning their pumpkin beer this Fall! If you’ve never had it, their pumpkin beer is a huge local favorite. For a while, it was only available for one night (their Halloween party). More recently, it’s been available for most of the Fall, but only at the brewpub. Here’s hoping! While Saturday has sold out, tickets are still available for the Friday session of the Pittsburgh Summer BeerFest! As always, there will be food and live entertainment, not to mention the awesome beer list. Plus everyone’s favorite perk, the souvenir glass! The event is taking place on Stage AE on the North Shore. Roundabout Brewery is turning two! Come out to their Lawrenceville location on Sunday, July 12, 12pm – 5pm to celebrate! Three bands (recently added to the lineup: Kiwi Ukes! ), two food vendors, and two new beers. Best of all, no admission charge. Just come down and enjoy the celebration! Voodoo is having their first Summer Block Party this year on Saturday, July 11. They are using the event as a fundraiser for the Homestead Fire Department. Starting at noon (12:00pm) and running until approximately 9pm, the event tickets cost $25 and include a beer and a pulled pork sandwich. They are expecting to have live and DJed music as well as a small fireworks display.